Shown here is the rubber-type SCOTTS SUB MOUNT (Stabilizer Under Bars) for the KTM 690E/R and 690SMC from 2011-2018. The rubber mount is tucked in very nicely and provides substantial reduction in vibration on this model. This mount kit includes everything except the stabilizer and linkarm. The frame bracket mounts around the stock key and blends in nicely with the orange or black frames. It is engineered so that all the pieces fit around all your existing parts, except for the plastic shroud covering the key area, which requires slight trimming. The sub mount raises the bars on this model about 17mm, which seems to be popular with most riders. 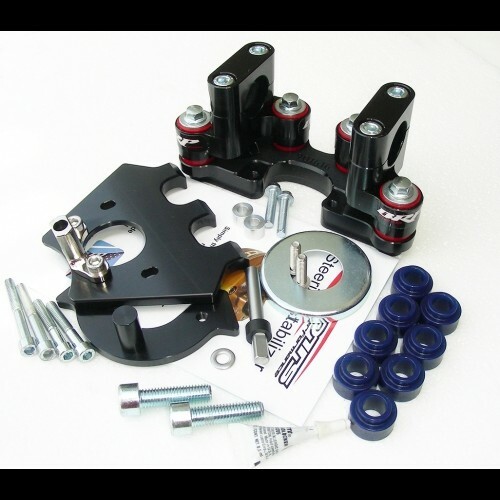 Note: Our T Post Mount RRP 020 is not required with this kit as the Scotts Kit comes complete with its own frame bracket mount. Note:This Scotts Sub-Mount will NOT work in conjunction with our Adventure & Rally Fairing Kits, as our fairing mount bracket moves the ignition barrel 6mm rearwards, which would require the hole in the aluminium plate of the Scott's mount needing elongating.